An officer's life depends on serviceable equipment. It's the responsibility of all officers to properly care for and check their gear, especially firearms and ammunition. A few minutes spent on inspection, cleaning and maintenance go far toward reducing the possibility of failure at a critical moment. This article illustrates different methods to ensure proper function by inspecting and testing ammunition, magazines and firearms. All mechanical devices are prone to failure, usually at the worst moment. Always develop a backup plan and backup equipment. The old saying "forewarned is forearmed" is more true today than ever. Do not presume a factory-loaded metallic cartridge or shotshell is serviceable simply because it came out of a factory box. Do not load ammunition into a magazine or cylinder without visually and physically inspecting the following. Make sure the caliber is correct for the weapon. Photo 1 illustrates the result of loading and firing a .40-caliber round in a .45-caliber chamber. Make sure each primer is fully seated, flush with the case head and right-side up (see Photo 2). Run your finger over the primer to make sure it's fully seated. If it's not, you will feel the raised primer cup, and you will need to dispose of the round because it will likely fail to fire. Primers can prove faulty and fail to ignite. The solution: Cycle the action and chamber another round. Do you train your officers on failure-to-fire malfunction drills? Do not use WD-40 or other penetrating lubricants on or around ammunition. Such lubricants can penetrate into the primer pocket and contaminate the primer. Ammo does not require lubrication. Make sure the case head is round and without dents or overstrikes. I have .38 Special rounds that were double-struck on the rim during the case-forming process, which caused the rim to be deformed and out of round. These cartridges would chamber in an open cylinder, but because of the raised case rim, they prevented the cylinder from locking into the frame. In an emergency, an officer reloading with this defective ammo would find the revolver useless. Inspect shotshells at the top of the brass base to check for rollover, which occurs when the loading die catches the thin edge of the brass and rolls it over. This will cause the round to fail to fully chamber and can lock up the shotgun. I've not seen the brass base of a shotshell torn away by a shotgun's extractor, even after a shotshell has been reloaded many times. However, I have seen the rim of totally plastic shotshells torn away by extractors. This is true of imported shotshells that don't have a metal support inside the rim area of the base. Street ammo for shotguns should have a brass base. Check the case mouth or crimp. On metallic cases, check the case mouth for cracks or rollover. I have examples of factory handgun ammo in which a portion of the case mouth rolled over during the bullet-seating process (see Photo 3). These rounds fit in the pistol magazine but upon chambering will not fully chamber and will cause a stoppage. With shotshells, make sure there's a heat-sealed star crimp if you use buckshot. If it's not heat sealed, any buffer material in the shell that surrounds the pellets will work its way out of the crimp when carried under spring pressure in the magazine. The buffer material gets inside the magazine and action, inviting problems. Check for powder in centerfire rifle cartridges by shaking each one. You can hear and feel the movement of powder inside the case. I once did a check and found no powder in a .223 round. Unfortunately, you can't do this with most pistol ammo or shotshells. Check for stubbed rounds. After a pistol or rifle round is fed into the chamber, the force of the bullet impact with the feed ramp can push the bullet back into the cartridge case. Dispose of such rounds without shooting them. The manufacturers state that chamber pressure is greatly increased upon firing due to the compression of powder and reduced air space. More importantly, if you reload the stubbed round back into the magazine, it will very likely not feed correctly and cause a stoppage. Avoid charging the weapon by repeatedly chambering the same round. Repeated chambering can loosen the bullet in the case and batter the case head. After several chamberings, I dispose of a round. Check ammunition for chamber fit. Some officers cycle each round through the weapon to test feed and chambering. I consider this unsafe.One method: Remove the barrel from the firearm and drop each round into the chamber. It should fully seat without pressure. With a revolver, check the fit of all rounds in the cylinder chambers for flush fit and proper extraction. You can't use this method with firearms that do not have detachable barrels, such as the MP-5 or M-16. For all firearms, to easily and safely chamber check ammo, purchase and use a chamber test gauge from Brownells Shooters Supply (see "Contact Info," p. 71). This device features a metal cylinder bored to the same specs as your weapon's chamber. You simply drop each round into the chamber gauge. The round should fit flush and fall out the gauge when turned upside down. Most competitive shooters use this device; it's a must-have item. Aside from bad ammo, bad magazines cause most failures of detachable magazine-fed firearms. (By definition, a magazine is a spring-loaded, ammunition-feeding device. A clip is a piece of stamped metal or plastic that holds ammo for feeding into a magazine.) I suggest numbering all magazines with a scribe or indelible marker and testing all mags on the range. Test them fully loaded and about a quarter full. Some mags work fine fully loaded, but due to spring-tension issues, fail when only partially loaded, particularly M-16/AR-15 30-round mags. Regarding M-16, 20- and 30-round magazines, I recommend loading only 18 and 28 rounds maximum, respectively. Some say it doesn't matter, but I've seen numerous bolt-over-base failures with fully loaded M-16 mags. The bolt does not strip the round from the mag, but instead rides over the top, dents the cartridge case and causes an irregular shape. The round will not chamber and all attempts to force the round into the chamber using the forward assist simply create a greater problem. A bolt-over failure requires clearing the weapon and recharging with a fresh round. Additionally, anyone who has attempted to seat a fully loaded magazine when the bolt or slide is forward and in battery knows it can prove difficult. Why? A fully loaded mag has maximum spring compression. As the magazine is locked into the magazine well, the top round presses against the bottom of the bolt or slide. If more pressure on the top round in the magazine will not further compress the magazine spring, the magazine catch will not engage and lock in place. The first sharp movement (or firing the weapon) can cause the magazine to fall from the weapon. Use separate range and duty magazines. Test your duty mags on the range, but avoid throwing them on the ground, stepping on them or allowing dirt and sand to contaminate the interior. Periodically disassemble your magazines, inspect and clean them. When you find a bad magazine, immediately mark, discard and replace it. Your life is worth a $25 investment in a new magazine. Regularly inspect the feed lips. Replace any magazines on which the feed lips have become dented, bent, cracked or otherwise marred. Also check the fit of the magazine in your weapon. If magazines that have previously been smooth on insertion begin to bind, the magazine body may have become dented, bent or warped. Photo 4 shows a cracked mag lip. Dry firing shotguns can break firing pins. During our SWAT firearms day a number of years ago, one of our officers returned from his squad with his duty shotgun. He chambered a slug and attempted to fire-click. After determining there was no hang-fire problem, we ejected the shell. When inspected, there was no primer strike. Taking the shotgun into the armory and disassembling it, we found the firing pin had broken sometime in the past. The broken ends were laying over one another, rendering the shotgun useless. To check a shotgun firing pin, remove the barrel (extended magazines make this more difficult) and hold a penny over the firing-pin hole as you dry fire. The firing pin will strike hard against the penny and indent it if all is working properly. If the barrel cannot be removed (because a magazine extension is fixed to the barrel), make certain the weapon is unloaded, drop a large-diameter wooden dowel rod down the barrel and let it rest against the breech face. When the firing pin moves forward during dry firing, it indents and propels the rod forward. Avoid dry firing your shotgun excessively. If you prefer to carry a pump-action shotgun with the slide unlocked, you must drop the hammer by dry firing the weapon. Keep this to a minimum. While I have not experienced a modern center-fire pistol breaking a firing pin as a result of dry fire practice, I strongly suggest monitoring the condition of the firing pin on all weapons, particularly those subject to repeat dry firing. Note: When reassembling the M-16 system after cleaning, you must position the firing pin retaining pin behind the firing-pin flange. It's possible to position the pin in front of the flange, blocking the firing pin movement forward when the hammer strikes and preventing the weapon from firing. In our patrol rifle classes, we have seen this happen even after cautioning officers about this issue. On the street, improper assembly can lead to disaster. Check the extractor and extractor spring (where applicable) on your firearms for cracks, a chipped hook area or total fractures. 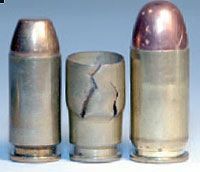 I have seen chipped or broken extractors on Colt government .45s and .38 Supers, Sig 220s, and Glock 21s and 22s (see Photo 5). The extractor spring on the HK M-P 5 can weaken after thousands of rounds and need replacing. When cleaning a firearm, visually inspect the extractor for breakage and to ensure brass shavings or powder residue have not built up under the extractor hook. If the extractor fails, the weapon fails. For rifle ammo, you need a backstop designed to stop high-velocity projectiles. Clearing drums should have mechanical stops to prevent officers from shoving muzzles directly into the sand. A cover prevents splashback in the event of a negligent discharge, and keeps rain and snow out of the clearing drum. The splashback from a sand-filled drum, frozen into a solid chunk of ice, could prove hazardous. The drum should also have a safe area behind it. Remember, we are asking people to point their weapons at the drum and pull the trigger. History reminds us that not everyone will hit the drum, and there may even be a second discharge as a startle response caused by the first. Use of a protective backstop is mandatory, protecting from mechanical failure and unintentional or negligent discharge. Vital equipment can prove faulty. Officers must understand how to check for identifiable problems and perform basic safety and function inspection of their firearms and accessories. And with all firearms, safe use and operation of the weapon depends on the handling skills of the operator. In the big picture, the time spent checking your gear, weapons and ammunition amounts to little, but the security it brings is priceless. Taking care of your ammo, equipment and firearms, combined with safe handling techniques could save your life. Stay safe, wear your vest and check your gear. Jeff Chudwin is president of the Illinois Tactical Officers Association and chief of police and range master for the Village of Olympia Fields, Ill. Chudwin has been a competitive shooter and firearms/use-of-force trainer for more than 25 years. He developed Illinois' certified 40-hour Rifle/Carbine Instructor Course for N.E.M.R.T/IL Mobile Training Unit #3 and assists with instruction of the rapid deployment/active shooter training course.